The Rolex Datejust is, insofar as is possible, the definitive “watch”. It has a design that has barely changed in 60 years and is a familiar sight even to non-enthusiasts. Often cited as the most counterfeited watch in the world, it is also one of the most homaged with everyone from Seiko to Bulova making their own version of the watch. The fluted bezel, the date magnifier, the jubilee bracelet: all are iconic and often copied. But how does the real thing hold up compared to the pretenders? My Rolex Datejust dates back to 1977 and is one of the last of the 1601 models. Starting in 1978, the movement was upgraded to the calibre 3135 which had a higher beat rate, added a quick change date function and improved accuracy. That’s not to say there is anything wrong with these older watches. The 3D “pie pan” dial is sought after by collectors, and there are very few fake Rolex watches of this model which makes it easier to pick up the genuine article with confidence. The lack of a quick date change is fine so long as it is worn regularly or kept on a watch winder. I really like the slower beat rate of the vintage movement – it adds character, as does the plastic crystal. What is it like living with a Rolex Datejust? I don’t baby the watch as much as I thought I would. I wear it a lot, even when dressed down as it seems to go well with all manner of attire. It was designed to be worn, and I am not afraid of putting the odd mark or scratch onto it. Literally millions of these things were made and since Rolex no longer service the calibre 1570, spare parts can be fitted by all manner of independent watch shops without worry. It’s comfortable to wear and looks amazing – it really sparkles in the light thanks to the white gold fluted bezel and jubilee bracelet. We have written a guide to buying a Rolex Datejust online, with some tips to make sure you do not inadvertently buy a fake Rolex. 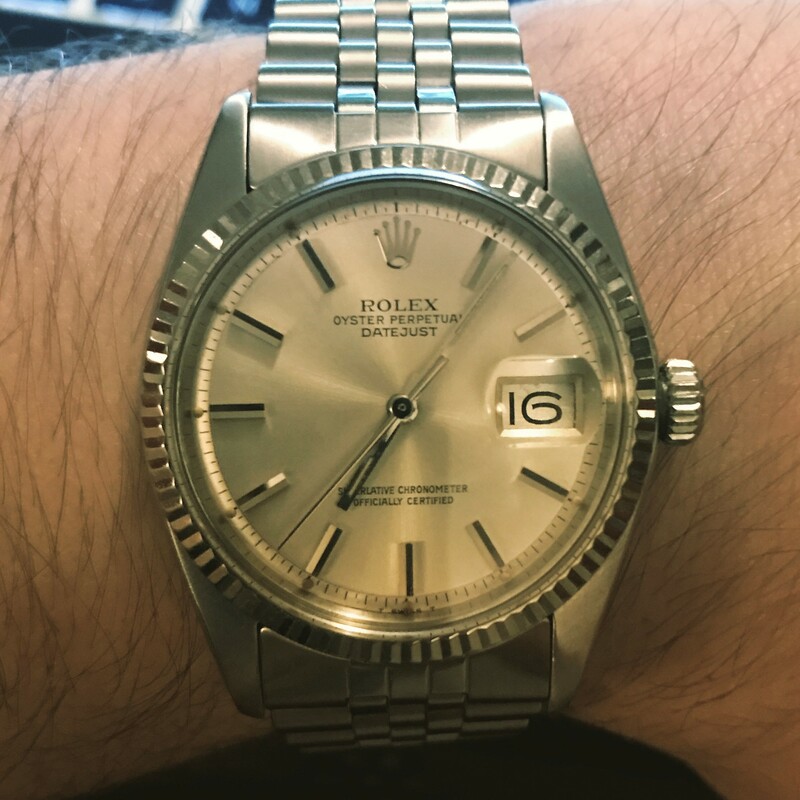 It is recommended to use a reputable dealer when buying a high-value item but if you stick to the 1601 model (and not the newer 16601 or 116601) and use a reputable dealer you can find a Rolex bargain on eBay. As of 2017, you can expect to pay in the region of £2,500 for a decent quality 1601 from the mid-1970s – the main thing to check is for “stretch” in the bracelet. Rolex bracelet stretch repair is possible, but it takes a while and can be costly – have a read about it here.